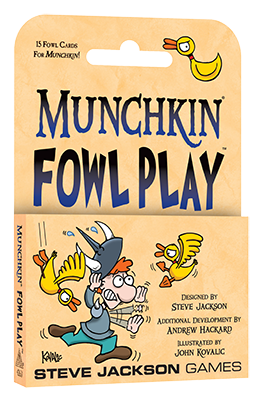 Daily Illuminator: Get Quacking With Munchkin Fowl Play! August 13, 2018: Get Quacking With Munchkin Fowl Play! Why did the duck cross the road? Don't ask us; that's just what John Kovalic drew. Because, as you know, drawing our feathered friends is John's specialty . . . so we thought it was time to let him draw an entire pack of them! Munchkin Fowl Play is a mini-expansion featuring 15 new avian cards to add to any Munchkin game! 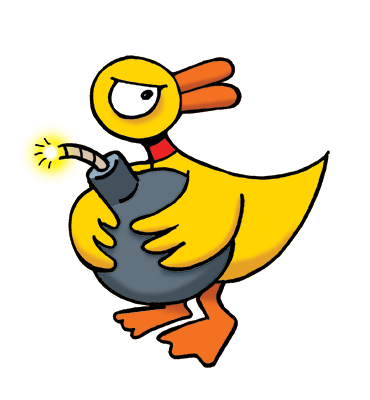 New Door cards mean you could Chicken Out at the explosive Duck of Boom, or fight helplessly against the abomination that is the Mandrake. We've also got some new Treasure cards, letting you Get Your Ducks In A Row, or even Duck And Cover from all of these puns. Whatever your flying fancy, this mini-expansion has it. You can find Munchkin Fowl Play at your local game store today, or on Warehouse 23!